The second main heading in the professional cook’s handbook I purchased a few weeks ago is “World Cuisines”, which is designed to familiarize the culinary professional with the key flavors of different food cultures. The Americas get twenty pages. Asian cuisines get fifty. Europe gets about 40, with entries for Hungary, Portugal, Spain, and ‘Eastern Europe’. The British Isles have no such entry in The Professional Chef. This saddens my heart. The late Laurie Colwin first opened my eyes to the notion that British cooking, particularly English cooking, could be enticing and wonderful in her book Home Cooking, which gave me a really good ginger cake recipe that I used to bake a lot in college. But it wasn’t my idea to do English-style bivalves. No, I give credit to Carolyn, my lovely librarian girlfriend; I was struggling with ideas for another Mussel Night. “Do something English,” she said. ”How would that work?” I said. I know this isn’t really true anymore, and hasn’t been for many years, but I didn’t want garlic to be a major player in this recipe – if you feel that two cloves of garlic is too many, I respect your opinion. 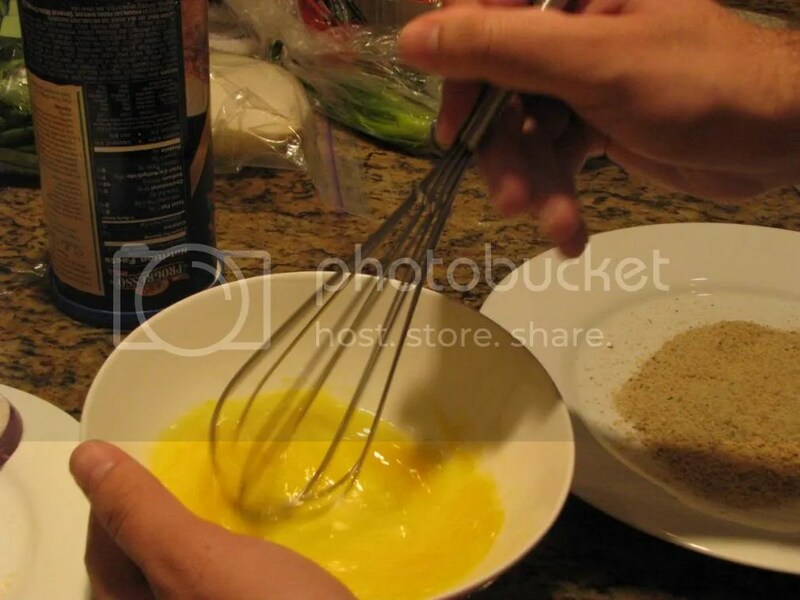 But I wanted the mustard to come out and play – and if I were being really awfully traditional, I’d be using Colman’s dry mustard powder, not (hateful, French) coarse-grained Dijon mustard. In fact, really, I should be thumping the table, eating a sausage off a knife, scratching my muttonchops, and damning the Dutch over my claret. But I’m an American, by cracky – and I ask you to forgive my my trespasses. I also felt that thyme was an herb so English as to be absolutely necessary. You must let no man steal it, after all. Jeez, this entry is so thickly buttered with references, I’m not sure what side would hit the floor first. She assured me I’d be happy with the clams, and I remembered that she’d asserted her preference for clams over mussels anyhow. She prefers their taste. They’re easier to clean, too – clams don’t have beards like mussels do. Jolene is right: clams are excellent! Mussel Day might become Clam Day for a while. Cockles and clams aren’t exactly the same thing. 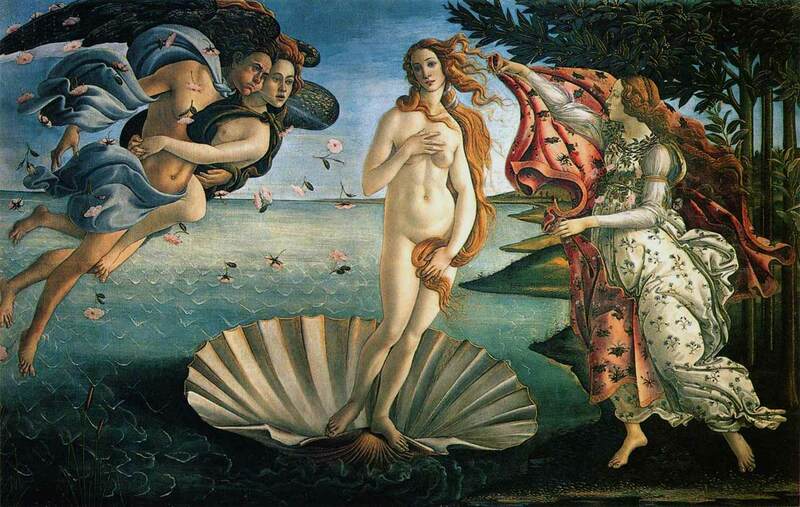 They’re both bivalves, and both part of the family veneridae (that’s right, all hinged-shell bivalves are named after the goddess Venus. ), and that’s good enough for me. A cockle is a little clam, and we’re using big clams. I apologize. I really wanted to name this recipe something jocular and Englishy, so there. And phooey on your insistence on accurate nomenclature. Go back to sleep, Carl von Linné; return to thy unquiet grave. 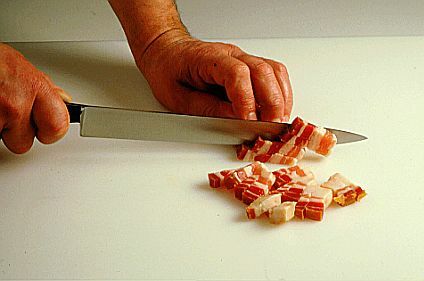 Execute your mise-en-place – chop up your onion, mince your garlic, dice your bacon thickly (if you have chunk bacon, make them into little cubes or lardons), and chop your potatoes into quarters or sixths, depending on their size. Scrub the clams with a brush and rinse them with cool water. 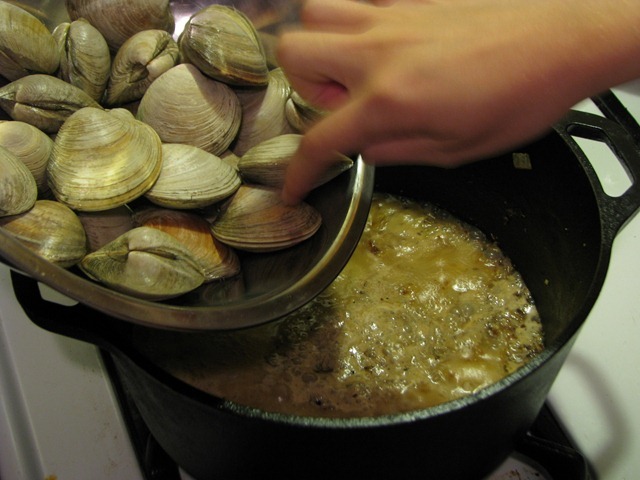 Do not cover the clams with water or they’ll drown, never mind the fact that you’re about to murder them in cold blood and hot beer. You don’t have to worry about the green onions yet – that’s the garnish. Collect your chopped potatoes and chuck them into your potato pot. Cover them with cold water, sprinkle in a teaspoon or two of salt, and put it on the stove over high heat. 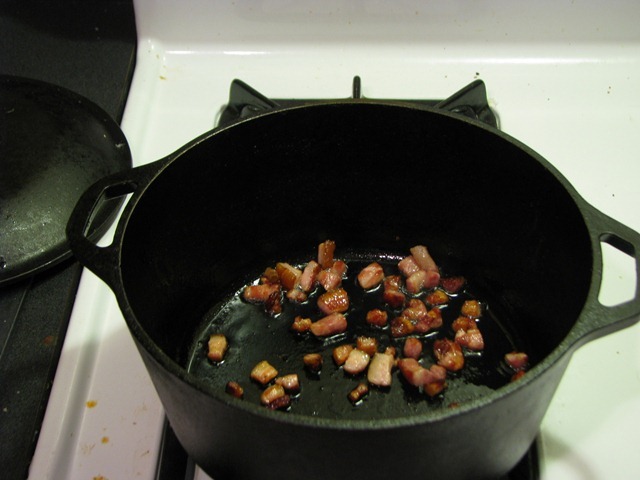 Meanwhile, begin heating your dutch oven over medium heat, and start cooking the bacon in the dutch oven. 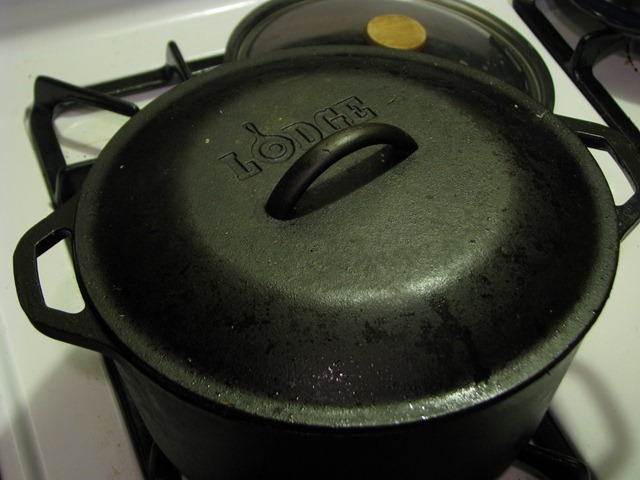 When the potatoes come to a boil, turn the heat down to medium-high and cook until fork-tender, almost crumbling. This will probably take about 25 minutes. I might start the potatoes before anything else, honestly. 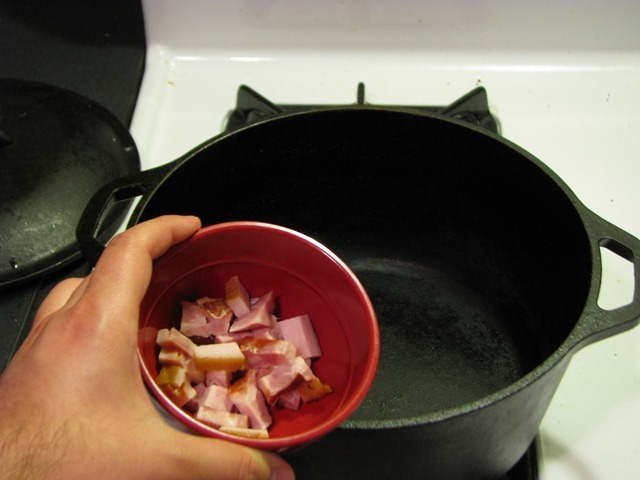 While the potatoes are cooking, and when the bacon is sufficiently crisped, remove it from the dutch oven with a slotted spoon and reserve it for later. 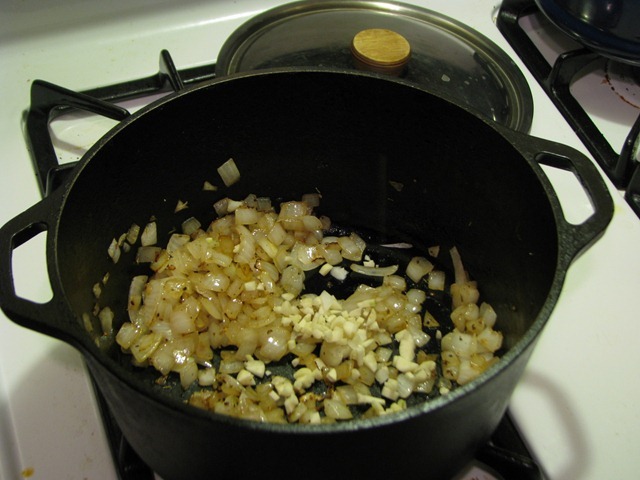 Cook the onions in the bacon fat until they’re soft, and somewhat browned – perhaps 5 minutes. 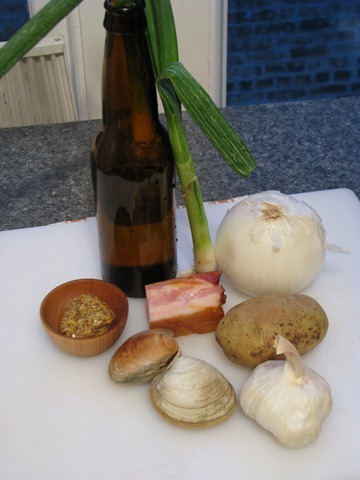 Then add the garlic, the mustard, and the thyme – cook for a few minutes until the flavors all harmonize and start singing together (that is, when you can’t distinguish any of the individual scents so distinctly anymore). 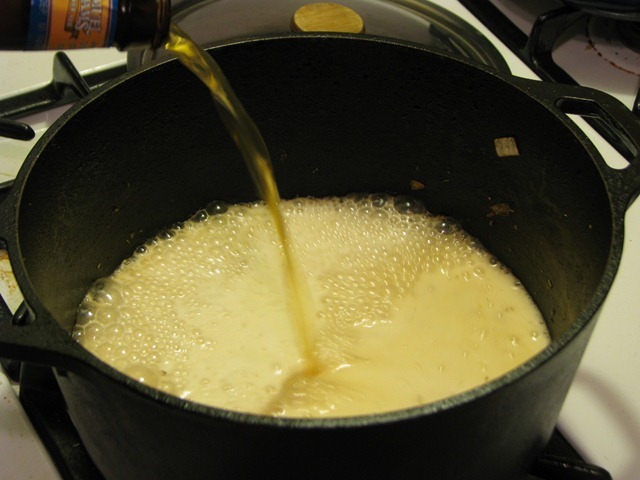 Pour in the beer and bring to a boil – wait for the fizz to abide before you make that judgment; it’s difficult to discern carbonation from boiling in that first minute. 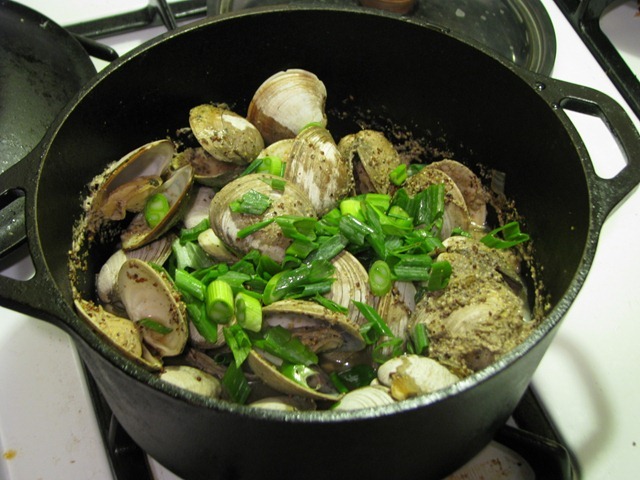 Toss in the clams, and bring to a boil again – then clamp the lid on your dutch oven, lower the heat to medium, and cook for 7 to 9 minutes, until the clams open up. Kill the heat. Also, Lodge: Send me money. Thank you. Drain the cooked potatoes and return the pot to the stove over low heat – throw in a few smallish cubes of butter, a healthy glug of milk, and a little dose of cream (a tablespoon or two), as well as salt and pepper. Mash, stir, don’t overdo it cause you’ll turn it to glue. 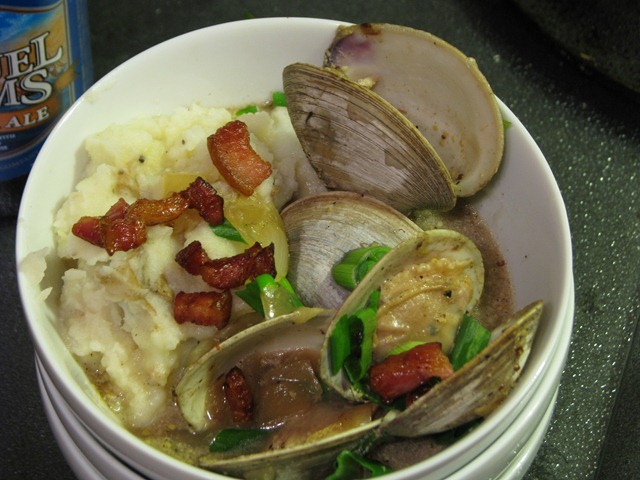 Slice the green onions thinly and sprinkle them over the clams – mix and then serve: fill half of a deep bowl with the mashed potatoes, and then the other half with the clams and their broth. Top with green onions and the reserved bacon.